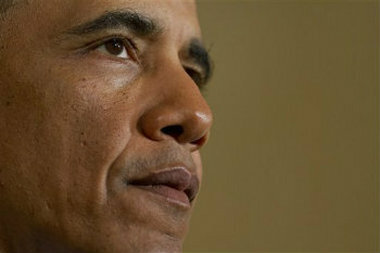 A Quinnipiac University poll finds that 59 percent of Americans disapprove of Obama's handling on health care. Americans aren’t getting any happier with the job President Obama is doing on health care. A new Quinnipiac University poll, released Wednesday, found that 36 percent of American voters said they approve of how the president is handling health care, versus 59 percent who said they disapprove. It’s Obama’s lowest ratings on all issues the poll measured, including the economy, terrorism and foreign policy. In December, Obama’s approval on health care hit an all-time low, with 34 percent saying they approved and 62 percent saying they disapproved. Low health care approval ratings for the president followed continuous problems plaguing HealthCare.gov, lower-than-expected enrollment numbers under PPACA, and news of cancelled insurance policies for consumers. “If — and it’s a big if — the president can convince the American people that the economy is getting better and that ObamaCare will be good for them, it will go a long way to rebuilding his sagging job approval ratings,” Tim Malloy, the assistant director of the Quinnipiac University Polling Institute, said in a statement. Health care is among Americans’ top priorities: 18 percent think it should be the top priority for Obama and Congress in 2014. The economy and jobs remain most important — 15 percent of voters named the economy and 16 percent named jobs or unemployment most important.